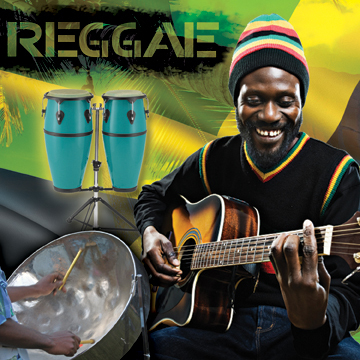 Be transported to Kingston Jamaica with Sonic RealityI's Reggae loop collection! Nearly 400 loops make up 13 construction kits of drums, basses, guitars, organs, and everything else you need to create authentic reggae music. Drag and drop loops to easily create endless combinations of loops with Sonic RealityI's Reggae loop collection! Note: Please refresh your browser if demo does not appear. This collection is the ideal writing and production tool for any musician and a great addition to popular products like Reason, Ableton Live, Mackie Tracktion, FL Studio, Stylus RMX (it has even been designed specifically to drag and drop into Stylus RMX), Apple GarageBand, Soundtrack, Logic, Sony Acid, Kontakt, HALion, EXS24, ProTools, Cubase, Sonar, Digital Performer and every other DAW or sampler. It is a universal loop sound collection that works with everything at a price that any musician can afford. What about the R.A.W. series makes it the ideal expansion libraries for Stylus RMX? Every loop in the R.A.W. series was organized in a special folder set up to comply with Stylus RMX’s drag and drop import capability for reading REX2 files. Stylus RMX users can add thousands of R.A.W.’s Rex2 grooves to add not only more acoustic “raw drums” but also bass lines, guitar riffs and other loops that you don’t find within Stylus RMX. How are the R.A.W. titles different from Sonic Reality Refills for Reason? The Sonic Refill series is predominantly multi-sampled instruments and patches for the various modules in the Reason rack. While there are some Rex2 grooves on the refills the R.A.W. offers a major focus on JUST grooves that are not only fully compatible with Reason’s DR. REX and NNXT but also happen to work with many other DAWS and Samplers as well since they are not packed into a refill just for Reason. You could say it is made FOR Reason users but ALSO for users of everything else in the same box! Can I use these loops even without owning a sampler or instrument plug-in? Yes, you can even bring these loops directly into your sequencer whether it is ProTools, Cubase, Logic, GarageBand, DP, FL Studio or anything else! You simply arrange them in your audio tracks. Since each loop is expertly sliced in flexible formats for control of the tempo and groove many sequencers have features that will allow these grooves to instantly change to the tempo of your song without you having to spend the time to stretch it yourself. It’s perhaps the easiest and most efficient way to create music which helps the creative flow. Does R.A.W. work with MacTel? Yes, R.A.W. is compatible with both older and new Macs and PCs. Be sure that the software you are using to playback the loops is MacTel compatible however. Are the loops tagged for searching inside Apple products? Yes, all Apple Loops can be searched by different genres, descriptors and other details about the sounds for convenient organization and efficiency inside Apple products such as Soundtrack, Soundtrack Pro, GarageBand and more. Do you have access to individual hits and on shots? If you own a sampler that reads Rex2 then absolutely! With REX2 format samplers like Kontakt 2, Reason NNXT, HALion and others map out the slices across the keyboard. You actually have tens of thousands of individual hits to play with in each collection There are over a quarter million slices in the complete R.A.W. series which is an unbelievably rich source of sounds for the money. The R.A.W. series is a music production tool with limitless possibilities whether you use the grooves as they are or manipulate them, change their feel, replay the slices, process and produce them to fit your music.